Sorry for being so far behind, but the BSG auctions have been dominating my life. Such a large project requires a lot of time and effort and I have little free time. The one thing I will say, is that much of what I have been saying about the poor communication from IAW and Dom, I can now verify is true. Since day one, Dom and Tiara have been saying they can't answer all the email, and of course Dom never returns a phone call. I get emails all the time from people asking me how to get IAW to respond to them. (Note that Colin is usually good here, but Dom a disaster). Well, at Propworx we reply to every email we get and I personally call every person back who calls me and I actually give everyone my personal phone #. We also have a forum that we engage our customers on. Customer Service just takes some effort. I will detail some of this in my upcoming 2 year IAW review. I use Burt's system of auction week numbering now. It is based on when auctions start. Check out the Star Trek Auctions Archive for any information you need on the IAW auctions! The Terran Empire MACO costume went to forum dynamo Donna at $ 3,605. It didn't have a back pack, since they didn't use them in the Mirror Universe, instead they had tactical vests, which appear to have been rented, as IAW has never sold them. These have been going in the $ 3,000 range consistantly, and this was a bit higher than normal. Still, a lot of stuff here! The Admiral Forrest Starfleet Uniform was an important costume and at $ 2,380 a decent price. I never liked the neck tie, but these are cool costumes and an important part of Starfleet history, as was Forrest. This one also comes with a Universal Translator. The Voyager Doctor Photo Double costume was nicely researched by Colin (and/or Colin's assistant). I always give Colin high marks on how well they research the items they list. This went for $ 1,325 and was probably fairly priced. We generally see stunt costumes for major characters going around this range. The TNG Command Red Starfleet Jumpsuit went for $ 1,001 and was probably about right. Command Red is always in demand, and the two pieces get much higher prices. These are nice costumes that look fantastic on display as the colors are pretty vibrant and the costume so iconic. After this there are mostly background Starfleet uniforms of various types and the prices were LOW. You all need to pay attention and try and steal one of these! Some great deals to be had. The Nemesis Style Starfleet Phaser Rifle is a goodie and a great buy at $ 1,500. This shows where prices are, as I paid $ 2,000 for mine two years ago. These are nice pieces that display well and will always hold their value at this price. The Star Trek III Specialized Puppet Genesis Planet Organism was kind of cool. We have been seeing these microorganisms for two years now, but this one is different. It was used to simulate the microorganisms moving around and to be used by a puppeteer. A very cool piece and it got a healthy $ 890 Model collector extraordinaire Adam, from the Star Trek Prop Forum, won the DS9 Upper Pylon Weapons Placement Model. Adam already has pieces of this he won at Christie's and from IAW and I think he is trying to re-create DS9 in large scale! At $ 567, a good deal for Adam. Finally, I think Dabo Chips are finally a good deal. At $ 371, the Dabo Chips from Quark's Bar were priced right! Best Costume of the Week: The Admiral Forrest Starfleet Uniform was an important costume and at $ 2,380 fairly priced. Best Prop of the Week: The Nemesis Style Starfleet Phaser Rifle is so cool, and at $ 1,500 a fair deal! Best Buy of the week: The Jadzia Dax Photo Double Costume at $ 485 was a STEAL! Worst Buy of the week: NONE! Good work everyone! Sleeper of the Week: The Dabo Chips from Quark's Bar were priced right at $ 371. Well, I finally have ventured into that rarified air that is TOS prop & costume collecting. There aren't a lot of TOS costume floating around, so when I had the chance to buy one, from a good buddy, I jumped at the chance. And the provenance is solid which makes me feel good about the item. 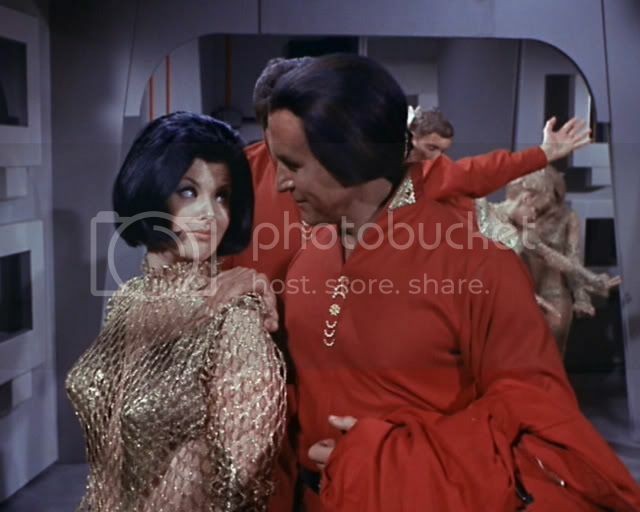 Many thanks to Tom Spina, who sold me his "Sleeper Suit" from the TOS episode "Space Seed". Who wouldn't want any costume from one of the greatest Star Trek epsiodes of all time! I saw this in Tom's collection two years ago, and when I was told it was up for sale I jumped at it. Tom graciously gave me the mannequin and framed photo as well! I also happen to be friends with the long time collector who originally acquired this costume from Western Costume many years ago, and so I know the history of this particular piece. Needless to say, I am very happy! Well, looks like IAW has changed their payment policy to be in line with eBay rules. There is no longer a restriction for payments over $ 2,000 being by wire transfer only, which violated eBay rules. Now, no matter how much you spend, you can pay with PayPal, which I think is important with IAW. I know many collectors who can only get a response from Dom when they charge back against their PayPal purchase. That seems to get his attention. I think the communication from IAW has slacked off lately. I get a lot of emails from people asking me how to get someone at IAW to call or email them back. I know Colin is pretty good usually, but even he hasn't been as good as he has always been. A bunch of my recent emails to him go unanswered. None the less, items get shipped and we still have auctions two years later! Because of the Battlestar Galactica auctions, we now have an account manager at eBay who I get to discuss eBay policies and listing practices and such with. Well, I know from our own experience listing very valuable items, that you MUST take Paypal for any item you offer with no restrictions. I found out this week in an email from Dom at IAW that they require a wire transfer for any amount over $ 2,000. Well, that violates eBay policy and you can't require that. So when I was paying for $ 12,000 worth of items I bought from IAW this AM, I used PayPal. I am sure IAW is going to hear from their eBay account manager about this, so we may see the stated policy change soon. I am sure IAW is trying to avoid the 2.9% fee you pay when using PayPal. However, that is the cost of doing business. When we were calculating our % with Universal for Battlestar Galactica, I figured in both eBay and PayPal fees as costs that we would have to absorb. Here is another great article, first posted in The Star Trek Prop & Costume Forum by forum regular Doug Shannon. The second non-working item I received was the Enterprise Stasis Case from the episode "Extinction" (interestingly enough, this prop was also used in "Dear Doctor", not as a stasis case but as a test tube storage container; it did not have lights in that episode). In this case, the IAW description indicated that the LED above the drawer was activated by a switch at the rear of the item, talked about a battery container in the tray with a depression switch (but did not indicate if it worked or not), and how you had to push "something flat" through a slot in the back of the item to get the drawer open. At least they didn't use the term "untested" in this auction. When I received the prop the top light was not working as described in the listing, so nothing worked on the prop. I found it interesting that while the battery compartment in the tray took AAA batteries, there were two AA batteries in the drawer when I slid it open with a knife...why they put AA batteries in the drawer was beyond me, but more on that later. The first fix was easy; I spent some time tracing the wiring inside the drawer and found two broken wires that were easily fixed with a soldering gun. Again, my first recommended course of action on these props is to check the wiring and contacts, which IAW doesn't do. 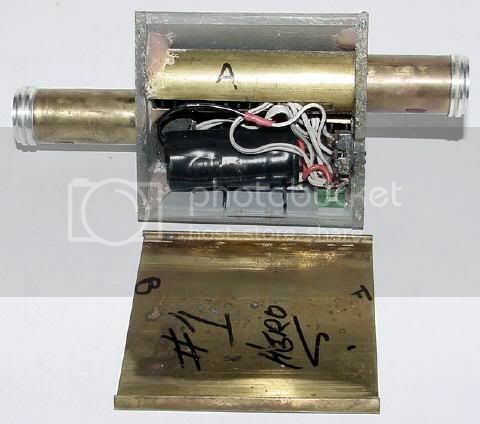 Once the wiring was fixed and the AAA batteries were inserted, the bottom drawer lit up when a test tube was placed in the slot inside the drawer, just like in the episode! Still no light on top of the box though. And I still hadn't figured out the drawer, why on earth would you design a drawer that had to be opened with a knife from the back? What a hassle to deal with that on the set! As you recall, upon receipt of the box there were two AA batteries in the front tray. I also noticed one AA battery in a small compartment that was just under the lip of the case if you pulled the drawer all the way out until it stopped. That battery was driving me nuts, I couldn't get it out because it was too big to fit between the lip of the case and the front compartment wall, and you could see it every time you pulled the drawer out, so my next step was to try to get that battery out of the prop without destroying the prop. I noticed that the "stop" on the drawer was a curved piece of plastic that is actually molded into the back of the drawer; so, very carefully, so as not to break the drawer or break the plastic piece off of the drawer, I used a flat headed screwdriver and carefully bent the stop down until it cleared the lip of the case and I could pull the drawer completely out (boy was that nerve racking, watching the back of the drawer bend to very close to the breaking point!). At that point I took a flashlight to the inside of the case and noticed...a second battery holder, upside down on the top of the inside of the case, and it was meant to hold, yes, you guessed it, three AA batteries! The batteries must have fallen out during shipment, which is how they ended up inside the bottom drawer. So tip number two is, there may be more than one battery holder in these things, even if the prop is small. Placing the batteries inside that holder lit the LED on top of the case, so now the whole thing was working. Of course! It's a magnetic catch, like you have on your kitchen cabinets! You don't need "something flat" to open the drawer, IAW! I placed the drawer back into the case, slid it shut, and pressed hard on it, heard the click, and the drawer popped open! Push it back firmly, another click, and the catch holds the drawer shut. It's pretty amazing what the prop guys do when they build these things! And, by the way, after all that work to make the drawer pop open like that, none of this was used on camera, the drawer is already open when Phlox takes the test tube from Archer and puts it in the case, he merely puts the tube in the case and slides the drawer shut. And to top it all off, someone forgot to activate the top LED light when they were shooting the episode, so it is not lit during the entire scene. This is a picture of the case with the drawer open, not lit (you can see the top of the rocker switch that activates the tray light in the middle of the depression). Here is a great article, first posted in The Star Trek Prop & Costume Forum by forum regular Doug Shannon. I have purchased several props from both Christie’s and IAW that were described as “untested” (which in normal speak means, “not working”) I thought I’d share with everyone the steps I took on the non-working props to get them working, in hopes of helping others do the same. The suggestions below may seem obvious to some but may be helpful to others like myself who are not electronics experts. I’ll do this in segments talking about the particular prop I fixed and what I did to fix it. The first “untested” prop I won that arrived in non-working condition was the stem bolt from Christie’s. Since, according to the battery holder inside the piece, it took an “N” type battery (easily available at Lowe’s) I figured that once the battery was put in it would not work, because it would have been easy for the Christie’s people to test the prop with an “N” type battery themselves. Sure enough, it didn’t work. I spent some time tracing the wiring (the wiring actually loops around some of the internal pieces of the prop, so it‘s hard to trace) and I also took sandpaper to the contacts inside the battery holder to make sure that the battery was making contact, but to no avail. There were no breaks in the wiring and the contacts were fine. If you have a non-working prop by the way, this would be my first recommended course of action, checking the wiring and contacts, as I did get one piece working by just taking sandpaper to the contacts. After having no success with the wiring and contacts, I thought that maybe the lights were bad; then the thought occurred to me, “what if it takes more power than the 1.5 volts that the N battery puts out? Even though the battery case says right on it that the piece takes an N battery, what if it needs more power?”. So I took a 9 volt battery and hooked it to a cap that I had purchased at radio shack with two loose wire ends and held each of the corresponding positive and negative ends of the wires to the positive and negative ends of the battery holder. Flipped the switch on and “eureka” I had lights!! Now the problem was, how do I fit a 9 volt battery into this small space? 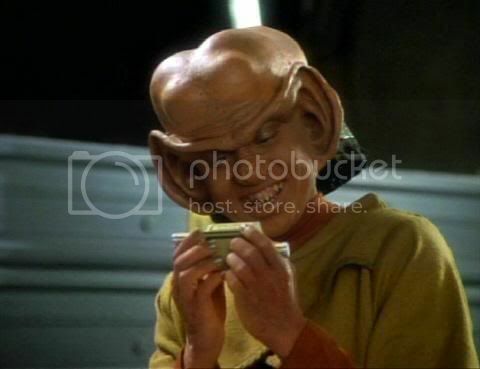 Then it dawned on me, I had also purchased a Tricorder scanner from IAW. The scanner was working. When I opened the scanner I saw that it was powered by six watch batteries that had been taped together, end to end, and there was my answer…….…..six 1.5 volt batteries together would equal 9 volts of power! So I placed six 1.5 volt watch batteries end to end (with the positive end of the watch battery facing the positive end of the N type battery holder) inside the N type battery holder in the prop (they fit perfectly in the space by the way) and I now have a working prop. So that’s how they get 9 volts of power into small spaces when a 9 volt battery won‘t fit. This is a picture of the inside of the stem bolt with the watch batteries in place (note that I wrapped electrical tape around the "N" type battery holder to keep the batteries in the holder). Nog holding a stem bolt; interestingly enough, he holds the bolt with the flashing lights facing him, so the audience does not get to see the actual, flashing lights of the prop! Auctions beginning December 12th, 19th. I have decided to just go with Burt's system of auction week numbering. It is based on when auctions start. Check out the Star Trek Auctions Archive for any information you need on the IAW auctions! While Week 105 only had 2 items, Week 106 had 156 items! A big week. Total sales were approximately $ 49,000 and the average item was $ 375. It was a very strong week with 12 items over $ 1,000 and 6 over $ 2,000! The Captain Picard Star Trek: Generations costume was a great deal at only $ 2,750. It is one of the ones used on Veridian 3, which you can tell as there is no Velcro on the chest for a comm badge. In the movie, Picard beamed down without one to confront Soran. This is a pretty rare one for Picard, and the version I proudly own myself. It is slightly distressed, but still a great deal on a Captain! A dynamite Cardassian Military Uniform went for a very reasonable $ 2,639, to forum member Chris. Good buy Chris! I have one of these and they are impressive on display and I think this was a very fair price. The First Contact Style Dr. Crusher Starfleet Uniform sure looked nice, and was fully priced at $ 2,625. The photograph made this look really good and it will display well. Jordino from New York, a Star Trek Forum member and premier Vulcan costume collector, won the Vulcan Kohlinahr Master Under Robe at a very strong $ 2,263. This is supposedly from ST:TMP and I am sure Jordino knows what he is doing as he has a great Vulcan collection! Forum member Donna continued to add to her impressive collection with the Jadzia Dax Starfleet uniform from trhe DS9 pilot "Emissary" at $ 2,125. I like this as we didn't see this style much in DS9 and it looks great in that sciences blue. IAW lists this as being in perfect condition. The Feature Style Vulcan Priestess Costume at $ 1,800 was very high for a costume that typically goes for $ 400! Sure it was complete, but I think this was WAY too high and gets the "Worst Buy" award this week. It was a nice copy with great details, but still way above market price right now. The Pavel Chekov Class C was a beauty and at $ 1,675 a fairly priced costume. The Voyager EPS Relay from "Relativity" was an important prop from a great episode, and it went for a strong $ 2,562. Nicely made from metal, this is a great prop and a good addition to Hank1701's collection. The Klingon Pain Stick at $ 1,493 was higher than previous versions, but still a fair price for a great prop. Not many more good props this week! Best Costume of the Week: The Captain Picard Star Trek: Generations costume at $ 2,750. Best Prop of the Week: The Voyager EPS Relay from "Relativity" at $ 2,562. Best Buy of the week: The Star Trek: Generations Captain Picard costume at $ 2,750 was agreat deal on a Captain's costume. Worst Buy of the week: The Feature Style Vulcan Priestess Costume at $ 1,800 was WAY too high! Sleeper of the Week: The Female Founder Costume at $ 688 was a steal! Star Trek: Generations Captain Picard costume at $ 2,750. Star Trek: Voyager EPS Relay from "Relativity" at $ 2,562. Star Trek: TMP Vulcan Kohlinahr Master Under Robe at $ 2,263. Well, because I am so buried trying to get out 800 lots of Battlestar Galactica props & costumes, my good friend Katie is going to guest blog! Here we are in Week 112, according to the startrekpropcollector.com Archive. Can you believe it – who knew IAW had this much to offer? With rumors flying around that the ‘end is near-- the end is near’ just like the ‘sky is falling’ – Collectors of props and costumes are amazed in what has turned into weeks, months, and years that these auctions just keep going! This week in particular seems be packed with fabulous costumes featured from TOS through the ST Movies. A rarity is a costume from the Original Series (TOS) from the episode “The Enemy Within” a blue jumpsuit worn by a researcher from planet Alfa 177, a rare costume indeed! For the Captain collectors, IAW has pulled out a Captain Picard “Commando” Variant Uniform Lot, which is a combination Hero and Stunt and would be perfect for someone who can’t live without a piece of the great Jean Luc! If Picard is not your Captain of choice, there is a Kate Mulgrew civilian lot up for auction consisting of a turtleneck sweater and a black blouse that would be a fabulous addition to any VOY collection. One of the most well known costumes up for auction is Leonard Nimoy’s Vulcan Robe and Tunic costume from the Undiscovered Country. We don't see many Spock costumes, and this is a nice piece, though incomplete. Another well known movie offering this week is the Command Red Dress Uniform featured in Insurrection, DS9 and ST X, which would be a nice addition (and probably a reasonable price) to any Star Trek collection. If you are a ST I fan, there is a Civilian Federation Costume as well as a shirt from the first Trek movie. Another Costume Lot featured in the big screen is a Star Trek II Khan Henchman Lot, for those Khan Noonien Singh lovers. The head piece in this lot is very nice and a great color. For the DS9 collector, IAW has a Commander Kira Nerys Red Starflee uniform, a nice item for the Nana Visitor or DS9 fan that was used in Season 7. For the unusual Trek Prop collector or if you just want to start, a skinned Klingon Targ prop used in the ENT episode “Sleeping Dogs,” would be a great conversation piece for those boring cocktail parties. These are just a few of the items that are up for Week 112, it appears to be a great week for the Trek Collector. After two years and one month, still going strong and if we are lucky, IAW will continue auctions with these types of treasures.